Everyone expects the MPC to raise rates on Thursday. This would be a mistake. Discussion about interest rate changes in the press normally involve large amounts of data and charts about the state of the economy. Here I want to do the opposite: to present the minimum you need to know to understand that raising UK rates right now is the wrong thing to do. Everyone should know that UK inflation is currently around 3% because of the Brexit depreciation. But because the impact of a deprecation on price inflation is temporary if wage inflation remains flat, the Bank said they would ignore this temporary rise. The key is to look at whether average earnings inflation is responding to higher consumer price inflation. The answer is they are not: average earnings growth has been slightly above 2% all this year, which is a little lower than the average for 2016. But what about unemployment being at a 42 year low? Surely that means earnings growth is just waiting to kick off. The first point is that unemployment is not currently a good measure of labour market slack. A better measure is the Resolution Foundation’s underemployment index, which is still above levels before the global financial crisis. And before you say but that was a boom period, it wasn’t. UK core inflation was below 2% throughout, and earnings growth was consistent with this. The other thing to say is that it is quite wrong to assume that we know what the level of labour market slack is that would lead to increases in earnings growth (what economists call the NAIRU). The NAIRU moves over time. As just one example of why it might move, a labour force that rents is likely to be more mobile than one that owns a house, and so the trend towards renting should reduce the NAIRU. So looking at the labour market, there is no sign that we are close to a level where earnings inflation might pick up. And that is pretty well a precondition for inflation to exceed its target of 2% over the medium term. That is all you really need to know. If you want to know why the MPC probably will raise rates, read on. What I suspect the Bank are worrying about is that Brexit has created what economists call a negative supply shock. In particular, both investment and productivity growth are much lower than the Bank were expecting before Brexit. They will point to various survey measures which show firms do not have any spare capacity. But this reasoning I think indicates a conceptual weakness. Firms have two responses to lack of capacity: raising prices or investment. By choking off demand and raising rates when firms run out of capacity the Bank will discourage investment, and right now what the economy desperately needs is more investment and the productivity improvements that brings with it. The Bank shouldn’t worry about a bit of inflation that might come with higher investment, because 2% earnings growth is an anchor that will prevent inflation deviating from target for any length of time. Finally, it is always important to consider risks. Suppose earnings growth does pick up sharply just after the MPC’s monthly meeting. The Bank always says it wants to be ‘ahead of the curve’, to avoid too rapid an increase in rates. This is the mentality that has led inflation to undershoot in the US and Eurozone since the recession, and if you take out the impact of depreciations by looking at the GDP deflator the same is true for the UK. The problem for the UK economy since the recession has not been too much inflation, but far too little demand. The obvious answer to this question is that the negotiator, the UK government, is completely split on what it wants. But that is only part of an explanation for this shambles. In the first year I think actions were dictated by a completely unreal perception about power, and perhaps more recently by a need to avoid a coup by the hardline Brexiteers. The people who might have thought about the negotiations before the vote itself, the Leave side, didn’t do so partly because they didn’t expect to win. But they also had completely unrealistic expectations of the relative power of each side. This was an advantage during the campaign, because they could say ridiculous things about the economic consequences of Brexit without knowing it was a lie. But once they had won, there were only two ways to go, and either of them led to an early implementation of Article 50. The first possibility is that after the campaign they continued to believe that German car makers would pressure the German government and the EU to give us what we want, so why not bring that on by triggering A50. The second was that they began to doubt this, but that in turn led to a fear that once the people found out they had been told falsehoods about leaving they would change their minds. That too lead to an urgent need to trigger A50 before this happened. The worst explanation for why the majority of MPs ignored this advice was that they didn’t hear it. (We know the Prime Minister did hear that advice from Sir Ivan Rogers.) Almost as bad was that they heard it but thought it was just a desperate ploy by experts to delay leaving. Those who want to say it is all because of mixed motives from the Labour leadership will do so. But I suspect there is a simpler explanation: MPs felt voting to delay was ‘politically impossible’. Part of the reason it was ‘politically impossible’ is that the standard of reporting and debate among broadcasters on these issues is so poor that the argument that triggering A50 was bad tactics would simply not have got a proper hearing. In addition the tabloids would have screamed “enemies of the people” just as they did when three judges allowed MPs a vote. In this sense our media not only gave us a Leave vote, they forced an early triggering of A50 which was not in the country’s interests. As I wrote in that earlier post, it “would only be a slight exaggeration to say [triggering A50] allows the EU to dictate terms” which is exactly what they are doing. In these circumstances, the best approach to the negotiations is to treat them as a cooperative exercise rather than a zero sum game. Yet we were led by Theresa May and David Davis, who were instead determined to treat this as a classical zero sum negotiation where, because you had more power, your best hope was to make the other side believe you will walk away. Yet that walking away threat was never credible, partly because of reasons already given, but more importantly because a deal on the EU's terms was better than no deal. But despite this, in our negotiators minds the delusion that we have power in these negotiations as long as we threaten to walk away seems to persist. The lack of flexibility by the EU can be dismissed as them playing hardball. As firms move abroad because they need to plan and they cannot be certain of any transition arrangements, the cost of delusion will be paid for in lost UK output and lower incomes. It is just possible that both May and Davis have begun to realise this, but the delusion of power has been replaced by something else, which is the fear of a coup by Brexiteers. The pro-Brexit views of Tory party members makes such a threat credible, but any coup would have to happen well before the negotiations ended. Perhaps the reason May is now being so slow to move is to make the possibility of a coup less likely. But perhaps that involves a level of strategic thinking the Prime Minister is not capable of and Davis has simply given up. Whatever the motivation, the end result has one certain consequence: the economy is damaged. As one final example, take the length of the transition period. The logical thing to do is to have a transition period until a new trade agreement is agreed. Anything else involves significant economic and administrative costs. But the UK government does not seek this because it pretends a trade agreement can be done quickly, and it pretends this nonsense to avoid a confrontation with the hardliners. Even if this turns out to be pretend and extend, because the transition period will keep on being rolled forward at the last minute, this arrangement suits the EU and damages the UK. It is good for the EU because their exports to the UK do not suffer. It damages the UK because the uncertainty continues to make moving production to the EU rather than exporting to the EU attractive. Just one more way that the fantasies of Brexit hardliners are costing us all. Sapir and Schoenmaker at Bruegel have a discussion of what a European version of the IMF might look like and do. Here are my thoughts on the sovereign debt (not banking) side, which I am sure will be regarded once again as radical and will therefore be ignored. I think some new Eurozone institution is necessary, but not for the reason that most people might think. The idea that the Eurozone might have a common fund that lends to Eurozone countries in fiscal difficulties with associated conditionality, as the IMF does, is a terrible idea. We know it is a terrible idea because of Greece. Think of the following scenario. A country getting into difficulties is lent some money by the EMF. That sum increases as existing private investors take fright. For whatever reason the ‘recovery plan’ imposed by the EMF goes wrong, and it becomes clear to all neutral observers that the country needs to default on its debts, including those to the EMF. As the EMF loan is regarded as ‘our money’ by a good part of the EZ electorate, this default is resisted and punitive austerity is imposed on the country so that the EMF can get its money back. This does not happen to the IMF because the electorate in any individual country do not think of their loans as ‘their money’, but it is naive to believe that wouldn’t happen with an EMF. It is exactly what happened in Greece, and it is also why moves to a political union are far too premature.. This raises an obvious question: why have an EMF, when we have an IMF? The wrong way of thinking about that question is that the Eurozone needed to supplement the IMF during the last crisis. The last crisis is not a good example because the ECB did not operate OMT until September 2012. The right way to think about the past is what would have happened if OMT had been operating from the start. The ECB is (rightly) only prepared to operate OMT for a country that is returning its financing to some sustainable level. For some countries that may not be possible, or desirable, without default. That was the case for Greece. For others that will be possible without default, as Ireland and Portugal have shown. You need somebody, or some institution, to decide which category a country finds itself in. But whether default is needed or not, a recovery plan (austerity) has to be put in place to return the public finances to sustainability and once that plan is in place OMT then operates. Once that happens, I think any lending should be done by the IMF for the reason I have already given . However it may well be that as long as the austerity is sensibly mild and drawn out , private sector lending will resume because of OMT. I think a new institution to do both the job of initially deciding about default and to create the recovery plan would be a good idea. But both decisions have to be kept as far away from politicians as possible. The reason again comes from history: the loans to the government that may require default are likely to be from banks or institutions in other EZ countries. That creates a serious bias towards ‘lend and pretend’, as we saw with Greece. How can you achieve such independence in the EMF? In addition, how do you justify giving an institution staff and resources when it hopefully will be hardly ever needed? One answer could be to use the IMF, although at the moment the IMF is not sufficiently independent of EZ politicians. Another is to utilise the network of independent fiscal institutions or fiscal councils that every EZ country now has. If those institutions live up to their name, they should be independent of politicians. In addition, they have exactly the expertise to decide on any default and to put together a recovery plan. Now the great thing about this set-up is that it allows fiscal autonomy in countries that have not got into fiscal difficulties. Fiscal discipline through the market is restored, because there is a clear default risk (but not the self-fulfilling default risk that operated before OMT). There would be less of a feeling in countries like Germany that they had to worry about fiscal policy in other EZ countries because they will pick up the tab because there will not be any tab to pick up. In that sense the no bail out rule is restored. What would the Brussels machinery that currently monitors each EZ country do? Am I proposing to put some Brussels bureaucrats out of a job? Not necessarily. A potential problem with the system I suggest is that fiscal councils will be captured by their governments. Brussels could ensure that the fiscal councils are independent, which would involve checking their assessments and forecasts (or even supplying them with forecasts). I can predict with almost certainty that some comments will be that I am taking crucial decisions away from democratically elected politicians and giving them to technocrats. We have enough of that in the Eurozone as it is they will say. There are two simple responses. First, in the absence of the Eurozone, governments that were no longer able to borrow would face the technocrats at the IMF. Second, we have tried the democratic route and it has failed spectacularly for reasons that will not go away in a hurry. There you have it. A feasible plan to increase sovereignty in the Eurozone and mitigate another Eurozone crisis and avoid another Greece. Now tell me why we have to move to fiscal and political union. Obviously in that case the IMF would also have to approve the recovery plan. A short sharp shock will almost inevitably lead to damaging negative feedback on output, perhaps creating another Greece. Dani Rodrik’s new book is a challenging read (in the good sense) for any liberal in the UK living through Brexit, or in the US contemplating whether Trump will destroy NAFTA. For example Chapter 2 starts with Theresa May’s statement about a citizen of the world is a citizen of nowhere, and the rest of the chapter is about how that statement contains an essential truth. Although Rodrik admits he himself looks like the perfect specimen of a global citizen, he argues convincingly that for most people the nation state represents their feelings of identity, of economic inequality, and provides their security (or not) after global shocks. Furthermore, he argues, that is how it should be. The next chapter considers the Eurozone as a case study of failing to appreciate these points. He argues, as many economists do, that this means either a much fuller political union or abandoning the monetary union. My own view is that the latter will not happen, and the former should not happen for all the reasons he gives in the previous chapter. What I think needs to be explored is combining a monetary union with national autonomy over fiscal policy in such a way that both prevents bailouts, by allowing default when inevitable, and otherwise allows the ECB to act as a sovereign lender of last resort. Only if that fails can we conclude that that the Eurozone has to go to political union or different currencies. If we mean ‘well advised’ in the sense of being more convincing, I doubt very much if this is true. Here I am always reminded of debates I have often seen on TV between a climate change scientist and a climate change skeptic. The scientist typically expresses exactly the uncertainties in the way Rodrik suggests they should, while the skeptic on the other hand, who is normally not a scientist, seem totally confident in the views they express. Unfortunately most viewers of this debate are not scientists, and we know people are attracted to those who are confident and self assured. The contrast is between scientific and political discourse: here is another example. But given this, doesn’t the ‘be modest’ imperative need to be modified by context? 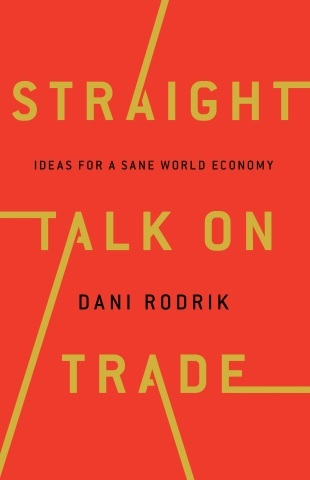 Of course one of the things Rodrik is best known for is in challenging the economists' consensus that trade agreements are always good, which I mentioned here and which he discusses in the book. As more and more economists are now realising, he was right to make that challenge. Perhaps the two perspectives can be reconciled as follows. The problem with the free trade advocates is that they were keeping quiet about known issues with their analysis because they thought it would give ammunition to ‘the other side’. As far as academic analysis of Brexit is concerned, and confining ourselves to the economic impact alone, I do not think the same applies. There are plenty more challenges in the book to what often goes as established economic wisdom. For example he argues against the idea that development would be hindered by worrying about workers rights in developing countries. He argues that state or crony capitalism has in many cases been a successful route to economic development. But mainly there is a wealth of intelligent, informed and often enlightening discussion about routes to economic development, the power of ideas over interests, why current unrest has generally not benefited the left and so on and so on. In that sense the title of the book is rather misleading. Although it is discussed a lot, this is hardly just a book about trade. Indeed the subtitle “Ideas for a sane world economy” conveys a better picture of what it is about. The book is based on a collection of articles written for Project Syndicate and elsewhere, and occasionally the joins show. But that feeling quickly gets lost in a wealth of stimulating arguments and ideas that I defy anyone to find dull. This is a fascinating book to read, and I cannot think of anyone who would not learn a great deal from reading it. A recent conversation got me thinking about different types of macroeconomic forecast error, and what implications they might have for macroeconomics. I’ll take three, from a UK perspective although the implications go well beyond. The errors are the financial crisis, the lack of a downturn immediately after Brexit, and flat UK productivity. The immediate cause of the Global Financial Crisis (GFC) was the US housing market crash, but that alone should have caused some kind of downturn in the US, with limited implications for the rest of the world. What caused the GFC was the lack of resilience of banks around the world to a shock of this kind. Were there any indications of this lack of resilience? Here is an OECD series for banking sector leverage in the UK: the ratio of bank assets to capital. The higher the number, the more fragile banks are becoming. Moving on to the second mistake, it is often said (correctly) that forecasters are very bad at predicting turning points or dramatic changes. But many did predict such a change immediately following the Brexit vote: a sharp and immediate slowdown in demand caused by the uncertainty of Brexit. It didn’t happen. The main reason was consumption, which held up by more than people were expecting, given the fall in real incomes that was likely to come from the Brexit depreciation. There are two and a half obvious explanations for this. First, because of Leave propaganda half the population thought Brexit would make them at least no worse off. Second, those who did anticipate the rise in import prices may have taken the opportunity to buy consumer durables made overseas to beat the prospective price increase. The half is that the Bank cut interest rates a bit. None of these effects are very new. They may not have been incorporated into the forecasters’ models, but they could in principle have been incorporated using the forecaster’s judgement, although getting the quantification right would have been very difficult. In the end we got the slowdown, but delayed until the first half of this year, as Leavers began to face reality and the higher import prices came through, so it was an error of timing more than anything else (although it was apparently enough to make MP Liz Truss change her mind and support Brexit!). You could describe it as an unchallenging error, because it could easily be explained using existing ideas. It is the kind of error that forecasters make all the time, and which makes forecasting so inaccurate. The third error was UK productivity, which I talked about at length here. Until the GFC, macro forecasters in the UK had not had to think about technical progress and how it became embodied in improvements in labour productivity, because the trend seemed remarkably stable. 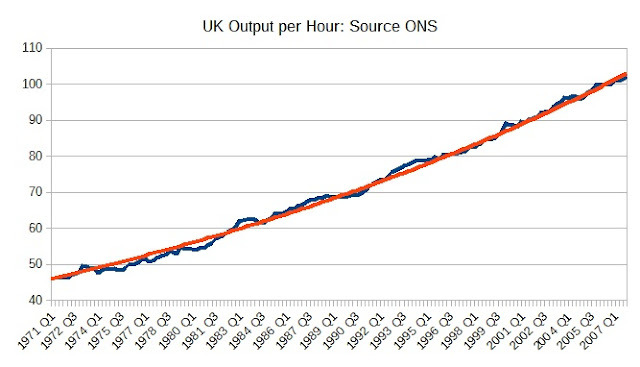 So when UK productivity growth appeared to come to a halt after the GFC, forecasters were largely in the dark. What many like the OBR did, which is to assume that previous trend growth would quickly resume, was not the extreme that some people suggest. It was instead a compromise between continuing no growth and reverting to the previous trend line, the second being what had happened in previous recessions. My point of writing about this again is that I think this third error is much more like the GFC mistake than the post-Brexit vote mistake. In both cases something important that forecasters were used to taking for granted started behaving in a way that had not happened since WWII. Standard models were used to treating technical progress as an unpredictable random process. Now it is just possible that this is still the case, and the absence of technical progress in the UK and to a lesser extent elsewhere is just one of those things that will never be explained. But for the UK at least the coincidence with the GFC, austerity and now Brexit seems too great. As as I showed in the earlier post growth has not been exactly zero but has oscillated in a way that could be related to macro events. If there is some connection, both in the UK and elsewhere, between the decline in economic productivity growth and macroeconomic developments, then this suggests an important missing element in macromodels. And like the financial sector, there is an existing body of research that economists can draw on, which is endogenous growth theory. There are examples of that happening already. But I want to end with a plea. After the financial crisis too many people who should have know better said that failing to predict the financial crisis meant that all existing mainstream macroeconomics was flawed. It was rubbish, but such attitudes did not help when some of us were arguing against austerity on the basis of standard macroeconomic ideas and evidence. Now with UK productivity, we have Aditya Chakrabortty saying that experts at the OBR “are guilty of a similar un-realism and they have proven just as impervious to criticism” as people like Boris Johnson or Liam Fox. Not content with this nonsense, he says “This age of impossibilism is partly their creation”. This is just wrong. Look at the elements of neoliberal overreach. Economists didn’t start calling for tight immigration controls and using immigrants as a scapegoat for almost everything. Most academic economists did not call for austerity. Almost all economists did not want to get rid of our trade agreements with the EU. Even if economists had warned about the financial crisis they would have been ignored because of the political power of finance. If all economists had thought productivity would continue flat we would have just had more austerity. And in making this basic mistake, it is ironically Aditya Chakrabortty who has joined Michael Gove and other Brexiteers in having had enough of experts. Less expected productivity growth means lower future output which means lower future tax receipts which means, given the government’s austerity policy, more cuts in public spending. It seemed obvious to write a post about the Peterson Institute’s recent conference on ‘Rethinking Macroeconomic Policy’, but nowadays I find it more efficient to let Martin Sandbu do the job. We agree most of the time, and he does these things better than I do. It allows me to write something only in the unlikely event that I disagree, or if I want to take the discussion further. I only have one quibble with Martin’s column yesterday. I think Bernanke’s suggestion that following a large recession (where interest rates hit their lower bound) central banks revert to a temporary price level target is rather more than the tweak he suggests. In addition, as Tony Yates pointed out, level of NGDP targets do not resolve the asymmetry problem that Bernanke’s suggestion is designed to address. I also thought I could illustrate Martin’s final point that “admitting one has got things badly wrong is a prerequisite for doing better” by looking at some numbers. If we look at consumer prices, average inflation between 2009 and 2016 was 1.1% in the Euro area, 1.4% in the US and 2.2% in the UK. The UK was a failure too: average consumer price inflation should have been higher than 2.2%, because we had a large VAT hike and depreciation that monetary policy rightly saw through. If we look at GDP deflators we get a clearer picture, with 1.0%, 1.5% and 1.6% for the EZ, US and UK respectively. You might think errors of that size are not too bad, and anyway what is wrong with inflation being too low. You would be wrong because in a recovery period these errors represent lost resources that, as the Phillips curve appears to be currently so flat, could be considerable. Or in other words the recovery could have been a lot faster, and interest rates could now be well off the lower bound everywhere, if policy had been more expansionary. I am not suggesting QE did not have a significant positive impact on the economy. But its use allowed governments to imagine that ending the recession was not their responsibility, and that what I call the Consensus Assignment was still working. It was not: QE was one of the most unreliable policy instruments imaginable. The criticism that this would involve the central bank exceeding its remit and telling politicians what to do is misplaced. Members of the ECB spent much of the time telling politicians the opposite, Mervyn King did the same in a more discreet way, while Ben Bernanke eventually said in essence something milder than the above. Under the Consensus Assignment we have invested central banks with the task of managing the economy because we think interest rates are a better tool than fiscal policy. As such it is beholden on them to tell us when they can no longer do the job better than government. A better criticism is that a statement of that kind would not have made any difference, and we could spend hours discussing that. But this is about the future, and who knows what the political circumstances will be then. It is important that governments acknowledge that the Consensus Assignment no longer works if central banks believe there is a lower bound for interest rates, and this has to start by central banks admitting this. Economists like Paul Krugman, Brad DeLong and myself have been saying these things for so long and so often, but I think central banks still have problems fully accepting what this means for them. The problems and deficiencies of this strategy come when the conditions required for the free market to be ideal do not hold, and the author’s long discussion of these problems would be useful for any economics undergraduate. One of these conditions for an ideal market is competition: a free market is an ideal from a social point of view if (alongside many other conditions) each good is produced by a very large number of producers. The author recognises, for obvious reasons, that most neoliberals (as opposed, perhaps, to ordoliberals) tend not to go around wanting to break up monopolies and reduce monopoly power. As a result, he distinguishes between market-neoliberals who might, and corporate-neoliberals who would not. He talks about past competition (that may have resulted in monopoly) and current competition. As Luigi Zingales describes it rather well here, business tends to be in favour of a competitive market before it enters it, but once it has a dominant position in that market it is happy to put up barriers to further competition. The author goes on to discuss conflicts between corporate and market neoliberalism, and much else besides. I think it is a great book, free from unnecessary jargon that you often find elsewhere. It got me thinking about the concept of neoliberalism again as you can see below. Whether that is a good thing or not, I would encourage you to read the book. 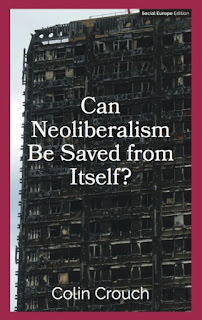 The author also of course discusses whether he thinks neoliberalism can save itself. For his answer to that question you will have to read the book. Now, for what it is worth, are some of the thoughts the book inspired. They go back to the distinction between market-neoliberals and corporate-neoliberals. It seems a little odd to define an ideology as the evangelisation of the free market, and then go on to say most neoliberals happen to exclude a crucial component of that free market (competition) when it suits them. I am quite prepared to believe that some of the people who first wrote about neoliberalism many years ago (and perhaps one or two today) could be described as what the author calls market-neoliberals, but as I have suggested in the past I think neoliberalism has evolved (or if you like been distorted) by ‘big money’ or capital to become a tool for self justification. 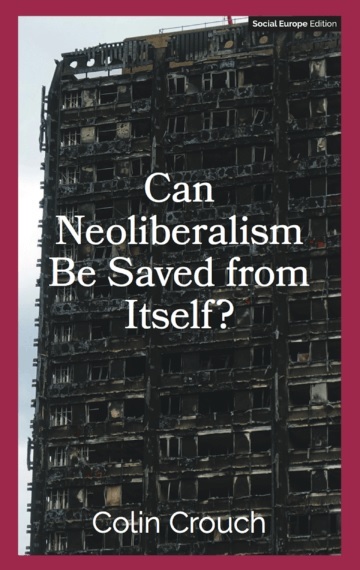 neoliberalism is a political strategy promoting the interests of big money that utilises the economist’s ideal of a free market to promote and extend market activity and remove all ‘interference’ in the market that conflicts with these interests. This replaces a definition based on following an idea (the author’s market neoliberalism), by one of interests promoting an idea so long as it suits those interests. This alternative definition seems to fit two cases I have used in the past to question more conventional ideas. Large banks benefit hugely from an implicit subsidy provided by the state (being bailed out when things go wrong), but neoliberals do not worry too much about this form of state interference in the market (whereas economists do). Regulations on the other hand they do complain about. It is a very selective focus on market interference. The second is executive pay. This is always justified by neoliberals as being something determined by the free market, when obviously it is not. Yet if you pretend that there is a market in executives and salaries etc are set by that market and not the remuneration committees of firms, then you are being a good neoliberal by defending these salaries. This example is interesting because it involves defending one part of ‘big money’ (CEOs or some workers in finance) at the expense of another (shareholders). It is why I do not talk about the interests of capital in my definition. Is this alternative definition simply negating the power of ideas and going back to good old interests? Only in part. Interests utilise an idea because the idea is a powerful persuasive tool. There is an obvious lesson for the left here. Because neoliberals promote the concept of an ideal market only when it suits them, so opposing neoliberalism does not necessarily mean opposing the concept of an ideal market. The left should utiliise the same concept to oppose monopoly power, for example. The idea of a free market is too powerful an idea to cede to the other side. When they do their forecast evaluation report, the OBR also look at the impact of fiscal policy on GDP. Here is the relevant chart from their report published yesterday. There is a useful innovation compared to previous years, which comes close to an something I suggested a few months ago. The orange bar shows the impact of fiscal measures implemented in that year. The total effect of fiscal policy is this plus the impact of previous fiscal policy actions unwinding. You can see when this matters from 2012 onwards. We have a run of years where the total impact of austerity on growth is zero or positive, but only because of the unwinding of previous austerity. If monetary policy, or anything else, had not been able to offset earlier fiscal tightening, then instead the impact of austerity would be to reduce growth in all those years. In that (extreme) case the level of GDP in 2016/17 would be over 4% below what it would otherwise have been without any fiscal tightening from 2010/11. As the OBR’s assessment of fiscal impact is in their publication on forecast errors, they naturally talk about whether there is any relationship between the two. This year they included this chart. It is important to understand what we are looking at here. It is not whether there is a correlation between fiscal consolidation and GDP. As we have seen the OBR assumes there is, and indeed their calculations were the source of my estimate that the average household had by 2013 lost a total of £4,000 worth of resources as a result of austerity. The foolishness of austerity in 2010 was not that the OBR underestimated its impact, but that it left us vulnerable to negative shocks because interest rates were at their lower bound. The shock that hit in 2012 was the Euro crisis and the impact of austerity there. What the chart above might tell us is whether the OBR have in fact underestimated the impact of austerity i.e the numbers in Chart E are too small. Each year there are hundreds of potential reasons for forecast errors, of which underestimating the impact of austerity is just one. So the best we can expect, if the OBR are underestimating the impact of fiscal policy, is a negative relationship going through zero between the two variables in Chart D but with lots of random variation on top. That is what we see in Chart D.
It suits the government to keep talking about the possibility of No Deal for as long as the first stage negotiations continue, for three reasons. First, there is of course the remote possibility that the other side will believe it and make some concessions to avoid it. Second, as concessions are made on the UK side, it becomes a palliative to Brexiteers: maybe the Lion will roar in the end. Third, when the deal is finally done, the collective response might be relief that No Deal has been avoided rather than indignation at the terms. But how can I be confident that No Deal will not actually happen? First, there has as yet been nothing done to prepare for that consequence, as Chris Cook outlines. Now you could rightly respond that this government is not known for its rational planning so this means little. But the lack of planning means that No Deal will bring UK chaos: not just firms leaving or going bust but highly visual dislocations like lorries clogging up ports and motorways. It would look like total economic incompetence, like Black Wednesday on steroids. It might mean the Conservatives lose not one but two or three general elections. That is not the legacy that May wants. The second reason No Deal will not happen is that she wants to be remembered, despite everything else, as the Prime Minister that got the deal done without destroying her party. The only way I can see of that not happening, given the pro-Brexit nature of Conservative Party members, is if she is unseated by Brexiteers. The chaos argument still applies. So those who try to remove May before a deal is done will be putting the terms of Brexit above party loyalty: not something you normally associate with Conservatives, but as Raphael Behr argues that is just what many Brexiteers might do. (An exception is surely Boris Johnson, who sees Brexit as his route to power and would prefer the safer route of the inevitable leadership election after the deal is done.) But they would need good cause, and the details of citizens rights, the divorce bill or even the terms of transition seem unlikely to be enough. What could trigger a revolt is if the EU presses the border issue at the first stage as I outlined here, forcing May to agree to stay in the customs union permanently or more likely abandon the DUP. Even then, there may be enough Remain MPs to block the challenge or enough members may choose to compromise rather than risk electoral oblivion. Yet although No Deal is very unlikely to happen, it will remain a myth long after the deal is done. It will become the excuse used by Brexiteers for why the post-EU period turns out to be no better and perhaps worse than its predecessor. If only we had ‘true Brexit’, they will say, things would have been different. Ironically a deal is useful to Brexiteers in that it gives them a story for why the sunlit uplands that they described during the referendum campaign did not come to pass. However we should still be concerned about No Deal rhetoric for the following reason. If you were the head of a firm having to decide to make an investment which would lose money if there was No Deal, would you have the confidence based on the analysis above to go ahead with that investment right now? I think you would be far more likely to postpone until you saw what happened. In addition there are all the EU nationals in the UK who continue to face a horrible uncertainty about their status under No Deal, as well as the prospective EU immigrants who will not come for that reason. Talk of No Deal, even if it is cheap talk, has real economic and social costs. Chris Giles had an article in the FT yesterday about the UK’s continuing dreadful productivity performance, and the implications this might have for forecasts of the public finances. It has the following chart comparing successive OBR forecasts and actual data. I want to make two points about this. The first is about the OBR’s forecast. It is easy to say looking at this chart that the OBR has for a long time been foolishly optimistic about UK productivity growth. Too often growth was expected to return to its long run trend shortly after the forecast was published but it failed to do so. Expect lots of articles about how hopeless macro forecasts are in general, or perhaps how hopeless OBR forecasts are in particular. It was obvious, these articles might say, that trend productivity growth in the UK has taken a permanent hit following the financial crisis. Anyone saying this is ignoring the history of the UK economy for the 50 years before the GFC. After each downturn or recession, labour productivity growth has initially fallen, but it has within a few years recovered to return to its underlying trend of around 2.25% per annum. This means not just returning to growth of 2.25%, but initially exceeding it as productivity caught up with the ground lost in the recession. 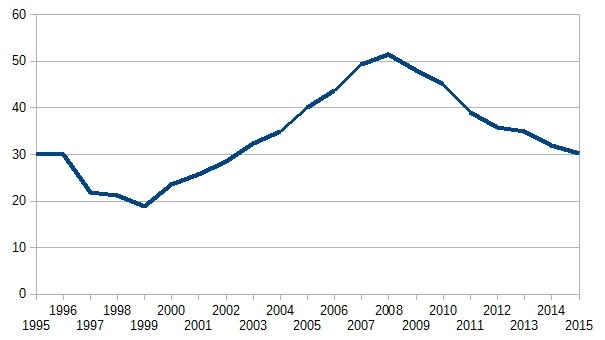 In a boom sometimes growth exceeded this trend line, but it soon fell back towards it. This made sense. Productivity growth reflects technical progress and innovation, and they tend to continue despite recessions. A firm may not be able to implement innovations during a recession, but once the recession is over experience suggests they make up for lost ground in terms of putting innovations into practice. Given this experience, OBR forecasts have always been pretty pessimistic. They have assumed a return to trend growth, but no catch up to make up for lost ground. If they had also forecast, in 2014 say, that given recent experience they expected productivity growth to be almost flat for the next five years that would have been regarded as extreme at the time. Why would UK firms continue to ignore productivity enhancing innovations when the macroeconomic outlook looked reasonable? These two points are related in the following way. The experience of the 50 years before the GFC suggested that you could hit the economy with pretty large hammers, but it would eventually bounce back. However that may have been contingent on a belief by firms that if policymakers were wielding the hammer (using high interest rates for example) they would take it away fairly soon, and replace it by stimulus. That belief was shattered in the UK by the GFC and austerity, where policymakers decided to keep using the hammer. What little confidence remained was destroyed by Brexit. Discoveries are still be being made in universities around the world, and we know innovations are still being implemented by leading UK firms. It seems completely far fetched to imagine the GFC is still having some mysterious impact on the remainder of UK firms such that they refuse to adopt these innovations. A much more plausible story is that we are seeing what happens when most firms lose confidence in the ability of policymakers to manage the economy. I am on the OBR’s advisory panel, but as our job when we meet once a year is to be critical of OBR assumptions, and as we have no role in producing their forecasts, I think what I say here can be completely objective. Productivity can initially fall because new employees are not as productive as those who have been working in the firms for some time, for example. Postscript (7/10/17) For evidence on the impact of Brexit on productivity, see work by Bloom and Mizen here. An alternative story is that the UK has settled into a new slow growth ‘equilibrium’, where the majority of firms are so pessimistic they hardly innovate at all.